Since July 2009, I have made six kinds of brownies, plus one bonus dessert using some brownies I had stashed in the freezer. (You can see the other five plus my brownie Baked Alaska here in my brownie category.) That’s a lot of brownies for me. Brownie number six is courtesy of Tanya from Chocolatechic. With a blog name like that, it was quite obvious that she’d select a chocolate recipe for us! In the book, Dorie explains that when she and Rick Katz were working on the set of the TV show Baking with Julia, Katz would bake goodies for them, including these brownies. She doesn’t say if Julia Child liked the brownies, but I bet that she did. I made half the recipe and baked it in a 9.25″ x 5.25″ loaf pan. I used Baker’s unsweetened chocolate and Guittard 61% chocolate. How it went: This recipe has an extra step or two than most other brownie recipes, notably beating half of the eggs and sugar and then folding them into the rest of the liquid ingredients. It was still easy to put together though. Even with the smaller pan, I baked these for the full amount of time. When the top looked dry, I took the pan out of the oven. How it tasted: Super-chocolaty and really delicious! These had the perfect balance of sweetness and chocolate flavor for me. I didn’t try one with coffee, but I think it would be a perfect accompaniment. I thought these were a bit too soft, but they didn’t seem underbaked, and Dorie describes them as “surprisingly creamy, soft, and definitively fudgy,” so I think that’s just how they’re supposed to be. My husband ate one and declared it one of the best brownies he’d ever had. When I asked him to elaborate, he said that sometimes the brownie crust and brownie inside taste different, but with these, the good flavor was throughout. He also liked that they were moist but not overly dense. He really liked the Tribute to Katharine Hepburn Brownies, but in a head-to-head competition, I think these would win. Would I make these again? : Yes. With all the brownies I’ve made since last July, I’ve discovered that my husband likes brownies a lot. Since he liked these so much, I think these will make an encore appearance in our kitchen! If you want to give these a spin, check Chocolatechic’s blog, or open your copy of Baking: From My Home to Yours to page 91. Big big hit here…I made them three times already b/c I kept thinking I was failing with the crunchy top. Oh, well, hope to keep failing in the future as the crunchy top was what the guys really loved about these! Yours look great, good to know about pan size and reducing. I will definitely make them again. They were rich and delicious and a true repeater. Oh! That ones mine! Don’t nobody dare touch that last on in the corner… It’s MINE! Miiiiiiiine! I tell ya! I loved these too and will totally make them again! love the single brownie left in the pan photo! I am going to have to check out your brownie variations – because you know I have a thing for them! I have at least a dozen brownie recipes and am excited to add one more! These were excellent! I made mine in muffin cups, they are cute! These were SOOOOO delicious! 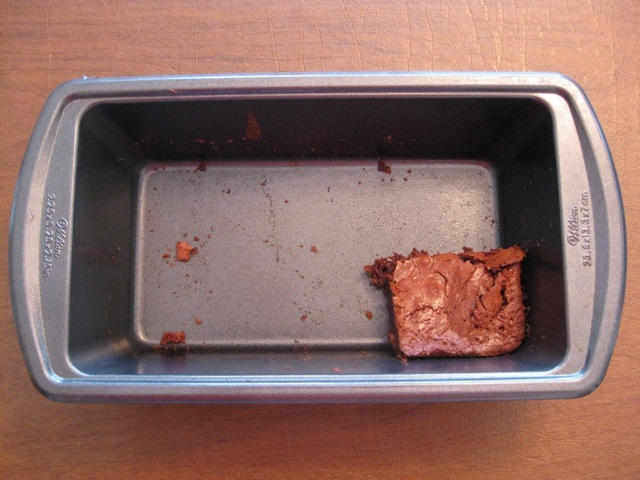 I love the picture of the one lone brownie in the pan! Glad you and the husband enjoyed these. I really liked them too. Perfect with some ice cream or a glass of milk. Family’s given up asking me to make things again. They know every week I move on to the next recipe. But I hope I get back to these. They deserve an encore. Glad you enjoyed! This was a good one, wasn’t it? Of all the brownies the group has made, this is my definite favorite; I like the idea of doing a taste-off, though. Ha… I did the same with a TWD lemon tart – photographed the empty tart pan! It went so fast -…. glad your husband loves brownies – these were quite good! These look great and cute photo! Your brownies look so good. I messed up on the directions..but my brownies came out tasting very good! Love the lonely brownie left in the pan. And using a loaf pan, what a great idea for 1/2 the recipe. I agree – these were so good, and super fudgy. That picture pretty much tells the story! I really liked these too, but I can’t quite get over the extra bowl and beater that have to be cleaned to make them. Clever to use a loaf pan. They must have been good, since they are all gone…. I love the idea of making half a batch in the loaf pan, less temptation sitting one the counter! Mmm, after reading your post I think I’ll have to make these again, like they’re supposed to be made. They sound perfect!